These more-or-less self-contained Mästermyr instructions will take you through the steps of laying out and constructing the trapezoidal-style chest. In this section, I’m going to discuss some of the differences between the 3 historical chests, and some overall design considerations for construction. This is the simplest of the 3 chests for several reasons. Let’s take a look at some of the archeological drawings and photographs. Figure 6 – conservation drawings for Oseberg 178. 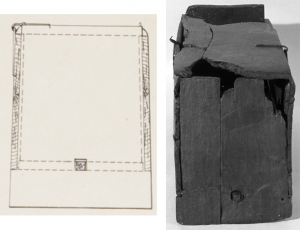 Figure 7 – zoom in of conservation drawing of the end of the Oseberg chest 178, along with a photograph of the end of the chest. Figure 8 – photo of the bottom of the chest. 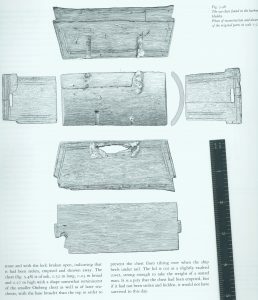 Things to note with this chest – as will all 3 of these chests, the bottom of the front and back is flush with the bottom of the floor of the chest. There is a very shallow rabbet along the sides which can easily be skipped in construction. 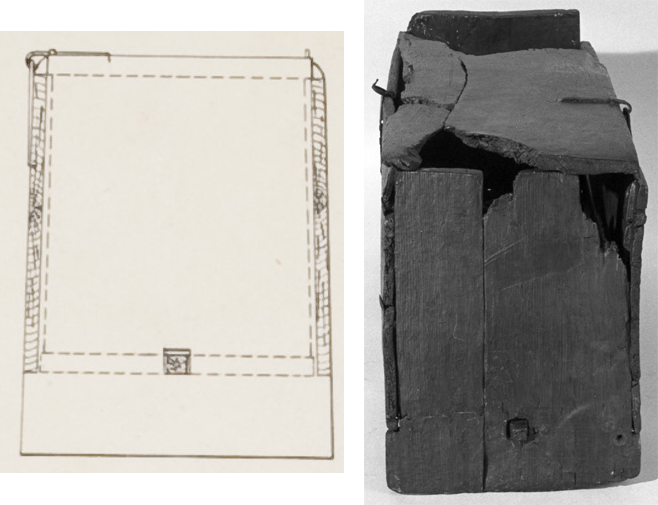 It’s also not shown in Figure 7, so the conservation drawings are not clear. The simplifying detail is the joint between the sides and the ends of the chest – the notch in the ends corresponds to the bottom of the sides, therefore no notch is needed in the sides – they are just plain trapezoidal pieces. There is also a shallow dado in the ends to house the floor, but unlike the other two chests, it does not have to be “blind,” so if you choose to cut this in, it’s much easier to create. 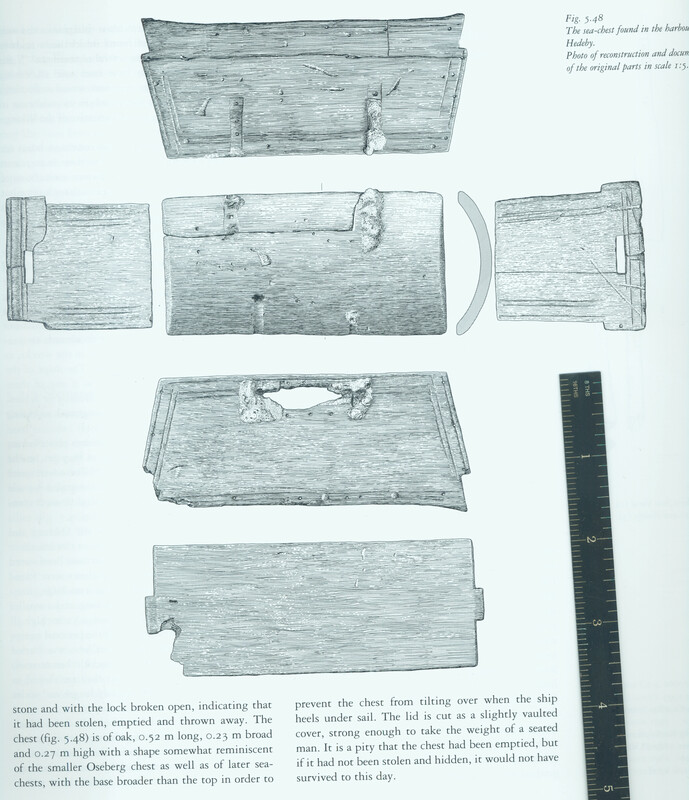 Figure 9 – Hedeby Sea-Chest drawing from Crumlin-Pedersen. Note the drawing is scaled, so the ruler was included in the scan to pull dimensions from the drawing. 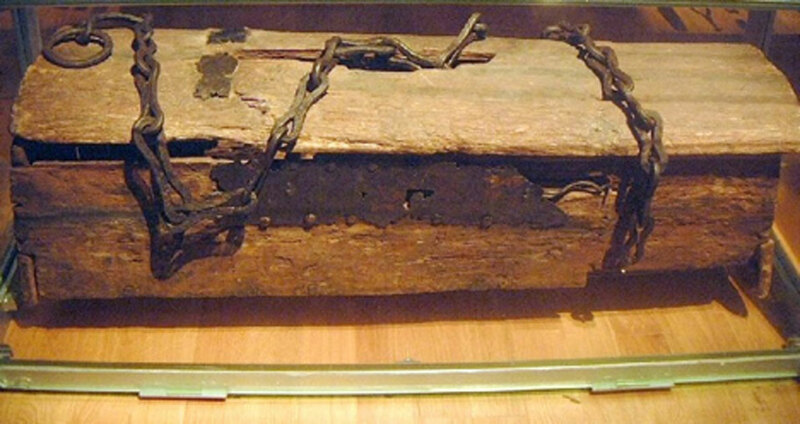 Figure 10 – Photo of the chest from the museum. Here’s a link to my older handout on building the Mastermyr style chest. This will walk you through construction of the slightly more complicated chest. Three Scandinavian Chests what tools do I need to build them? Of course, this is all my opinion. I’m primarily a hybrid woodworker, that is I’m comfortable using both hand tools and power tools. I find that in building these chests in a reasonable time the table saw and drill press are invaluable. That being said, I have made several with only hand tools. It takes a little longer, but it can be done. I’ve provided links as of January, 2018 to tools that I own or recommend. As with anything woodworking – you mileage may vary. a) For rough-sawn lumber, you’ll need some way to surface the wood smooth. There are many videos, books and magazine articles that will walk you through this process. For hand-tool work it involves stepping through several sized planes to achieve a smooth finish. For power-tool work, a jointer and planer are the tag-team needed to take rough-sawn stock to flat, smooth and square. b) A saw of some sort. Probably 2 at least. For cutting boards to length, you’ll need a saw for effective cross-cuts. You will also probably want a rip-cut saw to make smooth cuts along the grain of the wood. There is tons of information online about saws and sawing, some of it even worthwhile. c) A block plane to clean up the end grain. Even if you buy pre-surfaced wood, a block plane is indispensable for smoothing the end grain of the chest sides and ends, planing the angle on the chest ends before marking, and cleaning up the joinery after assembly. This could all be done with a sander or sanding block, but it will take much longer than using a plane. Lee Valley makes a very nice low-angle block plane. For about ½ the Lee Valley money you can get a WoodRiver block plane from Woodcraft. a) The goal is to minimize the measuring, but you’ll need at least a ruler or yardstick longer than the longest dimension of the chest. A tape measure will work, but is less accurate and cannot be used to guide a marking knife. A small (6”) rule and/or square is invaluable. b) Pin-type marking gauge. Especially if you’re going to use oak or ash. The pin-type is best for ring-porous woods. A knife-type marking gauge could be used on pine or tight-grained woods such as poplar and cherry. If you think you’ll be doing other woodworking in the future, a gauge that has both dual pins for mortise and tenon work and a single pin will come in handy. c) Marking knife. This can be as simple as a box cutter. A knife with one flush surface will be the easiest to use to transfer dimensions. Woodcraft sells a reasonably priced marking knife, as does Ron Hock. There are several companies that sell marking knives for vast sums of money if you need something to spend your paycheck on. d) Pencil. Perfect for rough-marking independent dimensions, and for highlighting a scribed line if your eyesight isn’t up to 20/20. e) A bevel gauge. As I’ll explain in the construction section, the inclined angle of the ends of the chest sets a number of other measurements during construction. A good quality sliding bevel gauge can be set to the desired angle at the beginning of construction, and used to mark the top and bottom bevel on the ends, and the angle of cut at the ends of the front and back. It can also serve as a visual reference while chiseling out the end mortises. Even the very good quality Shinwa that I use is only about $25.00. a) Some chisels will be needed. A medium-sized (3/4” or so – wider than your thickest board) chisel for cleanup, and a narrower (1/4” or 3/8”) chisel for cleaning up or excavating the mortises in the end boards. I really like the Ashley Iles bevel-edge chisels from toolsforworkingwood.com. Other good, affordable brands include Two Cherries and Narex. b) Drill and drill bits – Drilling out the mortise before chiseling is the fastest way to excavate. A Forstner-style bit is the best for this, and they can be used carefully in a hand drill or brace. A drill press with a table will give the best results with minimal practice. A bit to drill out for the wooden pegs or pilot holes for nails will also be needed. Although a brad point bit will give the cleanest holes, any style bit will work for the fasteners. c) A joinery saw. If you are roughing out your parts with a hand saw or power saw, you will still need a saw to do some of the fine joinery. This could be a western or Japanese saw. Toolsforworkingwood’s Gramery crosscut (carcase) saw is amazing, but expensive. Lee Valley makes a carcass saw that’s about 1/3 the price of the Gramercy, but still very good. d) Work holding. Some way to clamp the pieces securely while cutting or drilling. e) A good hammer – both for adjusting, and for driving pegs or nails. The first project I want to share is a build of a medieval-style frame saw. One of my long-term goals is to have a toolkit of passably medieval tools that I can use at SCA demos. Next, I’ll show you what I did with the image to produce a plan to build the saw.